The classic fondue is made with Gruyère and Emmental cheese melted with white wine and a splash of kirsch, a clear brandy distilled from cherry juice and pits. This riff on that tradition is made with imported Italian fontina Val d’Aosta, a rich, nutty cheese used to make fonduta, the famed fondue of northern Italy that combines cheese, egg yolks, and cream. The broccoli is a pretty touch but is optional, as is the crushed red pepper. 1. Preheat the oven to 350°F. Place the bread cubes in a large bowl and drizzle with the oil. Use tongs or your hands to toss the bread, coating it with the oil and adding a little more oil if the cubes aren’t evenly coated. Spread the bread on a large rimmed sheet pan and bake for 20 minutes, or until very lightly toasted. Remove from the oven and let cool. 2. Heat to a boil a 2- or 3-quart saucepan half filled with water. Add the broccoli and salt and boil for 3 minutes, or until tender. Drain in a strainer and rinse with cold water. Set aside. 3. Rub the inside of a flameproof ceramic fondue pot with the cut sides of the garlic. Discard the garlic, or reserve for another use. Add the wine to the fondue pot and bring to a simmer over medium heat. (Check the manufacturer’s instructions to see if a heat diffuser is necessary.) Add the grappa. 4. In a large bowl, combine the cheese and flour and toss to combine. Gradually add the cheese, a handful at a time, to the simmering wine, stirring vigorously with a slotted metal or wooden spoon after each addition until melted before adding more cheese. Fold the broccoli and red pepper into the melted cheese until blended. 5. Put the bread cubes on a platter or in a basket and place on the table. Place the tabletop heater in the center of the table and place the fondue pot on top. 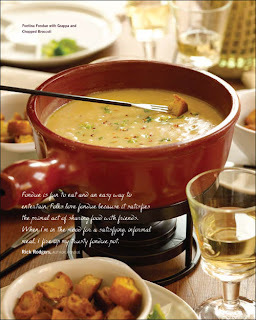 Provide each diner with a fondue fork for spearing the bread cubes and dipping into the communal pot.